Luxury phone designer Alexander Amosu has created a diamond-encrusted version of the 8GB Nokia N95. 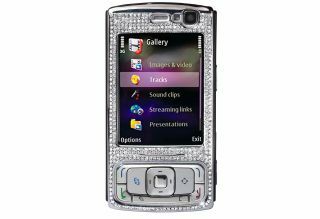 Yours for the bargain price of £12,000, the Nokia N95 is made from 18 carat solid white gold with 325 diamonds. The total diamond weight is 3.30 carats. Only 10 diamond-encrusted models will be made, and you can personalise it with your name or initials. Included in the price is a 1-year international concierge service.